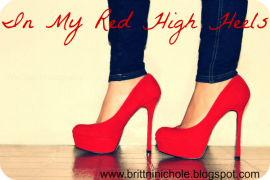 In My Red High Heels: Pucker Up, Buttercup! - If you have olive skin consider yourself lucky! You can just work whichever shade you'd like! -For yellow undertones, light creamy toned beige and latte or mocha shades work great! - It is important to make sure your lips are moisturized prior to applying! - Keep your outfit simple with neutral shades and accessorize with a pink shade or polish to match! - In the evening you should go bold and play it up! -Avoid deep reds if you have thin lips. They tend to make lips appear smaller. Not good!! - Keep the eyes simple during the day and play up the eyeliner and a nice smokey eye at night! - Be precise!! Don't just throw this on! - Don't overdo the outfit and take away from your lips! - Outfits of dark shades or neutrals go very well! - For dark skin, use it all! - Simplicity is key! Don't overdo your makeup. - Neutral clothes look great with these lips. Add colors with accessories. -Avoid wearing a lot of dark clothing. Might appear goth. I hope this excites you about dressing up your lips for a change!! It sure does me! What are some your favorite shades in these colors?? What about favorite brands? ?